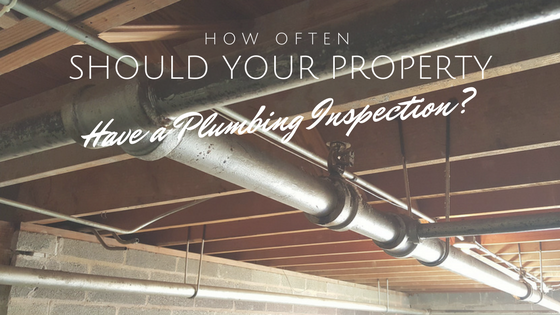 How Often Should You have a Commercial Plumbing Inspection? Plumbing inspections in Chicago can help you locate small plumbing problems before they become major catastrophes, including leaks, major blowouts and clogged drain lines, but how often should you schedule a whole-building commercial plumbing inspection? A commercial plumbing inspection involves checking the safety and reliability of your plumbing pipes. Most plumbing inspections include a visual walk-through, testing for leaks and checking every joint and seam to ensure they are properly fitted and contain no leaks. These inspections may also include a camera inspection of the inside of your plumbing pipes to determine if there are any cracks or holes or excessive corrosion that could immediately or in the future result in plumbing problems. After the plumbing inspection, you will be provided with a detailed report of all of the findings so that you can plan for current and future plumbing maintenance. The frequency of your commercial plumbing inspections will depend on the age of your system and whether or not you’ve noticed any plumbing problems, like pinhole leaks, low water pressure and discoloration or bad taste. According to Facilities.net, you should get your plumbing inspected and drains cleaned quarterly in order to prevent clogs and take care of any small problems. However, if you’ve noticed plumbing problems or seen an increase in your water bills and/or water repair bills, you may need to schedule an inspection sooner than every three months in order to determine the exact causes of your plumbing problems. If you have new plumbing pipes or just recently installed a new plumbing system, an inspection shortly after installation can determine if the pipes were installed correctly and that you are not experiencing any problems, like backflow and cross-contamination from drain lines entering the fresh water supply lines. Here at Nu Flow in Chicago, we offer whole-building pipe assessments to determine the corrosion levels and useful life left in your pipes. We primarily perform these inspections to determine if your plumbing pipes would be good candidates for our pipe lining process, which helps restore the integrity and durability of your plumbing system. Our plumbing inspections involve the use of a digital plumbing camera that can be threaded through your pipes. The camera relays the images onto a small LCD screen where it can be viewed by our professional plumber. The footage is also recorded so that you can view it while we explain the findings. We will also provide you with a detailed report that you can review later and submit to your board members, executives or property owner. If your plumbing pipes are good candidates for the pipe lining process, we will also give you an estimate for the cost of lining your plumbing pipes with an epoxy coating and/or epoxy pipe liners. This estimate allows you to review the costs and organize your budget so that you can restore your pipes trenchlessly. To learn more about our plumbing pipe inspections and to schedule a building pipe assessment, call us at 815-790-9000.